Searching our hearts, many Americans feel true grief, and a serious sense of disgrace, regarding our war in Afghanistan. This is to be expected. For many, the objectives which began this war in the first place have faded like a brooding, evening fog. We are left wondering if our stated primary goal, to unseat the tyranny of the Taliban, was truly our main objective, or was it really a deadly smoke-screen masking nothing more than a glorified pyramid scheme loosely called a “War”, which has been waged primarily to fatten Halliburton and their corporate cohort’s bottom line. Meanwhile, we do the Taliban’s work for them. By planting the seeds of oppression in angry, disenfranchised, and vulnerable youths, we only make the insidious indoctrination by the Taliban easier to take root in their hearts. I feel certain that our Service women and men consider it a war, having to face the lethal consequences of combat in often hostile terrain, or in urban areas filled with non-combatants, which impede their ability to completely defend themselves without endangering civilians. Even as the Taliban punish those who would help free their nation by branding them “collaborators”, they foster terror in the population, further hobbling efforts to help forge an independent Afghanistan. However, here at home we are not facing the reality of this war. 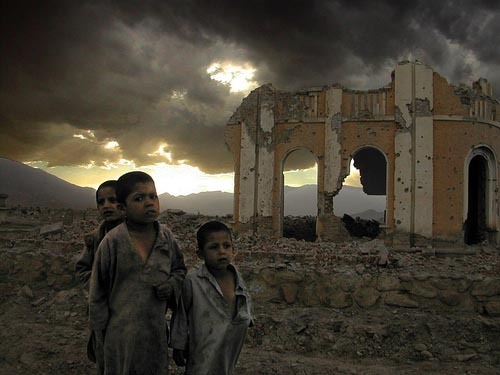 We are creating implacable enemies of a frightening percentage of a new generation in Afghanistan, and for what? Democracy? Such a statement is a grave insult to every citizen of Afghanistan, and also to our Service men and women who place their lives on the line every day. It is a war born of our monstrous foreign policy of a Democratized Earth and more importantly for our boundless thirst for oil. Nevertheless, it is the people of Afghanistan who will suffer most in this war. And currently it is a war without a foreseeable end. To our heartfelt dismay, we elected a President who promised to end this war. So far the Administration has only further entrenched us. With this poem, dedicated to all Afghani people, I pray you, Dear Reader, to plant a seed of empathy for the future. For the nation of Afghanistan, for all of the humans, soldier and citizen, caught in the fist of war, I call upon President Obama to stand tall and wage Peace. bread of noflour and despair. makes even your mouth water. the spring thunder of clean rain. and bread baked of Afghani grain. This entry was posted on January by Dawn Runs Amok. It was filed under Hoi Polloi—Protest and Dissent, Poetry by DC McKenzie and was tagged with Afghanistan, Big-Oil, poetry, Taliban, war. Nice work! I am happy to have rediscovered your work. Keep it up! Many thanks for your kind praise. You mentioned “rediscovering” my work…have we met? Perhaps at a mass gathering of like-minded folks? Also, please let me say nice work as well! After just a quick glance I can already tell that I will greatly enjoy your blog.